Teach your toddler about patterns while you put already chopped fruit on a kebab stick. When you’re done, they’ll love dipping the kebab in yogurt and shredded coconut or granola. Try fun new combinations. My little one enjoyed eating a fennel, pomegranate, orange, and mint salad. She was willing to try it because she helped make it! Cut an apple in half and scoop out the seeds. Then let your toddler sprinkle on some cinnamon. For added flavor, fill the middle with granola, oatmeal, or a few dark chocolate chips. Place it in the oven at 350 degrees until the apple is soft and caramelized. In muffin tray cups place a spoonful of plain yogurt. Your toddler will have fun placing berries and chopped fruit in each one. Put it in the freezer until frozen, and enjoy! 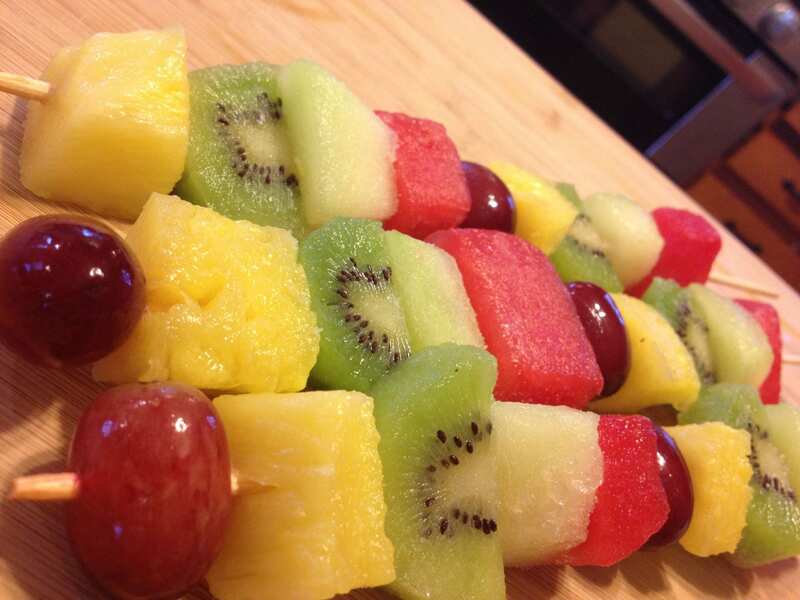 Blend a base (usually milk or yogurt) with fruit. You can also add a healthy fat (nut butter, avocado, hemp seeds or flax seeds) or veggies! Get creative and experiment with new combinations. Put your smoothie in a bowl. Then, top it with granola, chopped fruit, seeds, or berries. Let your little one pick out a fruit you have never heard of or tasted before! Make it a game and set a goal of trying one new fruit each week. If you start to run out of new options at your usual supermarket, look for an international supermarket in your area. Fill an ice pop mold with fruit juice and have your toddler add chunks of fresh fruit or berries. Freeze until it is frozen solid and enjoy! Eat ice cream, banana ice cream that is! When your bananas get over-ripe, freeze them. Then, blend bananas with a small amount of coconut cream or milk. The less liquid you add, the thicker it will be. Feel free to add toppings or experiment by blending in other ingredients. Here are some of our favorites:-Strawberry “nice” cream: Once the banana ice cream is blended, add a few strawberries and pulse. This way, there will be delicious strawberry chunks to enjoy.-Vanilla “nice” cream: add a few drops of vanilla extract before you blend the banana ice cream. -Nutty “nice” cream: blend peanut butter along with the frozen banana. Top with just a few semi-sweet chocolate chips. There is nothing like a ripe piece of fruit, so head to your local farmer’s market and enjoy it fresh from the experts. The farmers are often happy to share cooking tips for their produce!